Personally, the times I have the strongest cravings for "comfort" food are when I'm going through uncomfortable emotions like stress, anxiety, fear, sadness, the works. Whenever I feel like I'm too tired from my shift, I want something salty and crunchy to munch on. Frustrations sometimes trigger the urge for a bar of chocolate or a pint of ice cream. Emotional distress makes me binge eat. Yes, guilty as charged. And I know it's not a good habit. 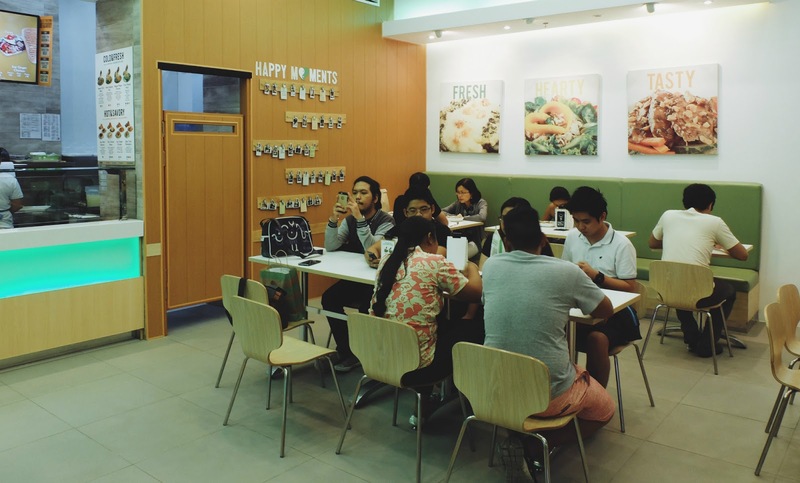 I received an invitation from Taters Group a week or so ago to visit their newly opened restaurant, Chimara Feel Good Kitchen, in UP Town Center. 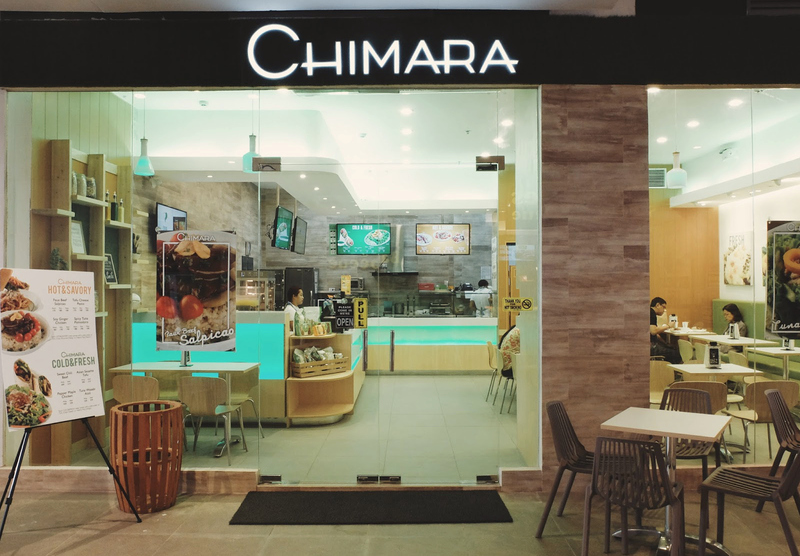 The statement, "Chimara aims to promote food that comforts everyone’s mood and lifestyle and, at the same time, make customers feel good about themselves." really made me curious, even more the branding "feel good kitchen." I did a Google search about them to further familiarize myself and found out that Chimara was formerly called Chimara Neo-Vegan Cafe. Let's be honest, the terms "vegetarian," "vegan" or "healthy" are always associated with bland and boring food so I was intrigued how they would fare. 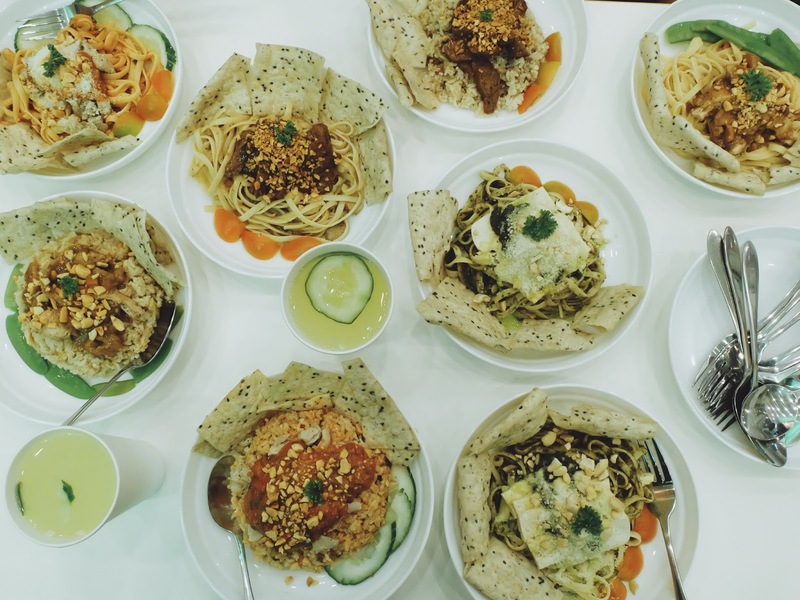 I figured this would be an opportunity to know more about mindful eating and to gradually knock the habit of equating comfort food with anything too greasy or too sweet, so I asked a couple of my friends to join me in dining at Chimara. 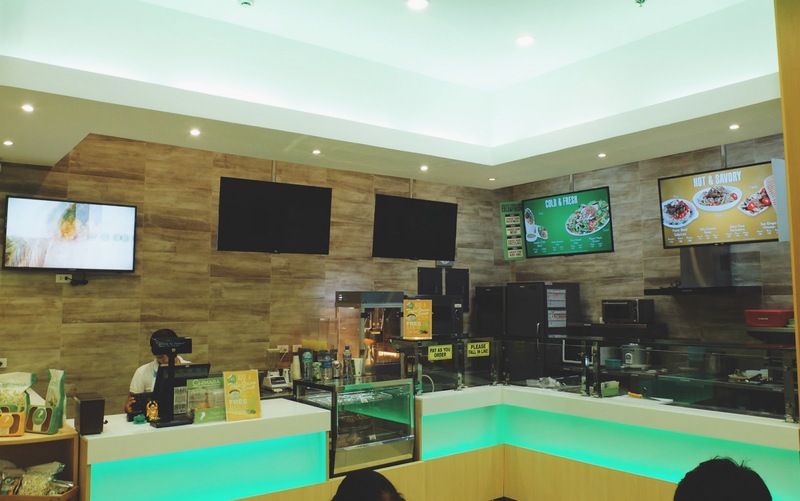 The bright and cheery splashes of green with the mix of wood made the restaurant more inviting. I especially loved the Happy Moments wall that added a youthful vibe. After we settled on our seats, we saw these Chimara Feel Good Food Guides to help us better narrow down what we'd be having, which I think was a genius idea since most people wouldn't know what to order in a vegetarian restaurant. There were questions like, "Stressed from work?," "Having brain drain?," "Feeling healthy?," etc. and each tab would have corresponding suggestions. You can also be adventurous and customize your own food! Just decide if you're going for Cold & Fresh or Hot & Savory and pick your preferred meat, sauce or dressing and other add-ons! Soy ginger chicken breast topped with snow peas, peanuts and carrots for a satisfying experience. Since we all came from work, we were super hungry and wanted something filling. We all chose to have food from their Hot & Savory selection. I picked the Spicy Tuna Pomodoro with rice, and I initially thought, "Mukhang bitin!" I underestimated the dish and I was glad to be proven wrong. They sure didn't scrimp on the tuna chunks that was generously topped on the rice. The pomodoro sauce had the right tang to it and the tuna chunks had the perfect contrast of flavor to it. The spicy part is relative since I think it could be turned up a bit more. Maybe in the future they could offer customers the option to adjust or pick their preferred degree of spiciness. The group favorite was the Faux Beef Salpicao Pasta. If it were not indicated in the menu that they use faux beef for this recipe, we wouldn't have noticed the difference. The pasta was cooked just right and the "beef" was tender and seasoned wonderfully. For our refreshments, we chose to have the Alkaline Lemonade, which is CFGK's house blend sugar-free lemonade with a zing of fresh cucumber and celery and the I Am Wise juice infusion, which is a memory-enhancing mix of mango, apple and tomato for mind invigoration. Yes, both of these drinks are as refreshing as they look! A delightful complement to our meals. Finally, capping off our satisfying lunch is the Crema de Cacao cupcake. The generous dark chocolate icing on top of moist chocolate cake was a treat for a sweet tooth like me. It reminded me of the quality of Cupcake by Sonja's Pepper cupcake. Sooo good. I wish they'd make a cayenne-infused version of this too! Overall, everyone's happy with their food! And that's a feat considering we're all twenty-somethings that enjoy a slice (or box lol) of pizza or cake or a trip to the buffet table every once a while! Added props also for the pretty way they plated the food and warm customer service experience. I'm really impressed by the variety, taste and quality of all the dishes we had and would recommend it to everyone who'd like to have a feel good lifestyle! Definitely changed the way I look at vegetarian food. Would come back to try their paninis!